The first European porcelain manufactory was founded on 6 June 1710 when Meissen’s global success story began. The first porcelain makers, led by Johann Friedrich Böttger, discovered the formula for making European hard-paste porcelain. Germany’s porcelain factories which enjoy worldwide fame include the Nymphenburg manufactory, where porcelain at its finest has been meticulously crafted by hand for 260 years. Production is based in a crescent-shaped building in the northern grounds of the Wittelsbach family’s baroque summer residence in the west of Munich. Soon after it was founded, the Nymphenburg manufactory began to work with high-profile artists – a fruitful tradition that continues to this day. The rococo figures by Franz Anton Bustelli from Ticino, for example, a master modeller who became artistic director for the company in 1754, are among the most exquisite products of their time. The Nymphenburg profile today continues to be shaped by international artists and designers. Among those who have produced innovative contemporary porcelain over the past few years are Konstantin Grcic, Clemens Weisshaar, Gustavo Lins and Ted Muehling. The company’s exclusive clientele includes members of the nobility and embassies as well as German and international churches. Nymphenburg porcelain has won numerous awards and enjoys pride of place in the world’s foremost design collections such as the MoMA and the Cooper Hewitt National Design Museum in New York, Amsterdam’s Stedelijk Museum, the Fondation Nationale in Paris, Vienna’s Art History Museum and the Pinakothek der Moderne in Munich (new collection). The porcelain museum which adjoins the factory at Nymphenburg Palace displays more than 1,000 pieces from various periods. Hessen is another German region with a proud porcelain tradition: Höchst porcelain, marked with the Mainz wheel, has been manufactured for more than 260 years. Connoisseurs consider it among the crowning achievements in European porcelain art. Johann Friedrich Carl von Ostein, archbishop and Elector of Mainz, granted a charter to the porcelain manufacturer in 1746, thus establishing the second-oldest porcelain works in Germany. The company’s head-quarters are in a listed industrial building dating back to 1906. Today’s visitors to the Hessian town of Höchst can discover for themselves how porcelain is made at the hands-on manufactory in the Neuer Porzellanhof, a listed building dating back to 1906. They can watch the entire production process from the making of porcelain paste and the modelling of the artistic figures to the meticulous hand decoration. These exclusive items can then be purchased afterwards in the factory outlet. Villeroy & Boch, the ceramics manufacturer, bears the name of its founders François Boch and Nicolas Villeroy and is still family owned after 250 years. The Villeroy & Boch visitor centre in Mettlach covers a thousand years of cultural history, the centuries-long tradition of ceramics making as well as pioneering “lifestyle” concepts – admission ca. €3. Refreshments are available in its café which itself is a masterpiece of historic interior design. 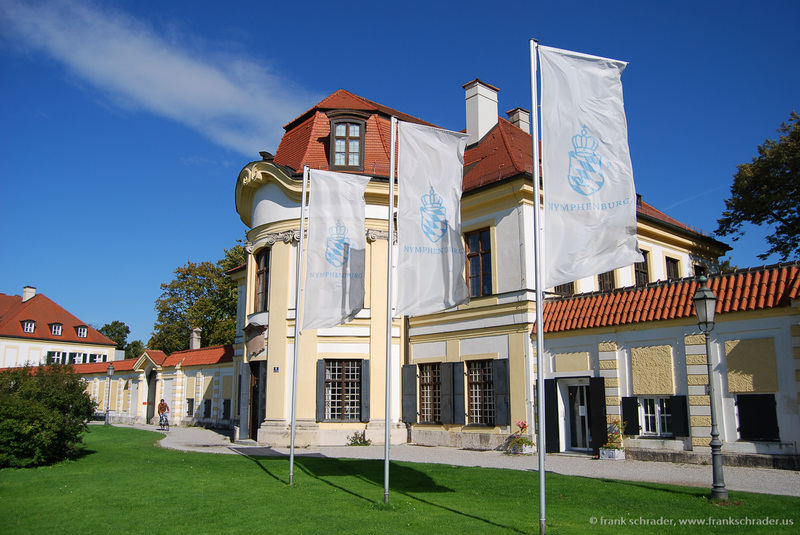 The Porzellanikon in north-east Bavaria is an essential destination for anyone interested in the history of German porcelain. It encompasses the German Porcelain Museum in Hohenberg an der Eger in the Fichtelgebirge mountains and three others just eleven kilometres away in Selb (European Industrial Museum for Porcelain, European Museum for Technical Ceramics, Rosenthal Museum). Both towns are venues for Europe’s largest ever exhibition of porcelain: A King’s Dream and Mass-Produced Goods. 300 years of European Porcelain. From 24 April to 2 November 2010, some 1,000 pieces – including loan items from 90 other collections from 17 different countries – will be on display in an exhibition area covering 3,500 square metres. In Hohenberg, the exhibition opening coincides with the reopening of the German Porcelain Museum after extensive refurbishment. As a collective of several museums, The PorzellanIkon can offer an insight into all aspects of porcelain through its permanent collections. The European Museum for Technical Ceramics in Selb, for example, is Europe’s first museum dedicated to high-tech ceramics and their applications in medicine, electrical engineering and space travel. Selb Porcelain Centre houses three different museums: the European Industrial Museum of Porcelain, the European Museum of Technical Ceramics and the Rosenthal Museum. The latter traces the history of this famous company from its early days as a porcelain painting business in Erkersreuth Castle to its current role as global supplier of lifestyle accessories. It showcases the life and works of Philipp Rosenthal, privy counsellor and founder of Rosenthal AG who was the first private entrepreneur to put his name, and that of his son Philip, on every product. Philip Rosenthal joined the firm in 1950 as head of advertising and was principally responsible for Rosenthal’s current position as leading manufacturer of tableware and interior accessories – particularly in the spheres of contemporary design and art. “Live and experience art” package: The neighbouring Rosenthal Casino Hotel & Restaurant offers inclusive packages to round off a visit to the museum in style. The “Live and experience art” package includes a sekt cocktail aperitif, two 4-course meals served on Rosenthal china, with wine to complement the food, plus bed and breakfast. Fluffy bath robes are provided in your room to snuggle into after your free sauna. The town of Selb in Upper Franconia is a main centre of porcelain production in Germany: its history as a porcelain town began when the Hutschenreuther factory was founded in 1857. This was the first place where porcelain was manufactured on a mass scale, making it affordable for normal households. Many other porcelain works sprung up in and around Selb after it was connected to the railways. Among them were the famous Rosenthal and Hutschenreuther brands which are based in the town to this day. As mentioned above, Selb’s distinguished porcelain tradition is reflected in its choice of museums: the Porzellanikon – incorporating the European Industrial Museum of Porcelain, the European Museum of Technical Ceramics and the Rosenthal Museum (plus the German Porcelain Museum in nearby Hohenberg an der Eger) – explores every aspect of this most coveted material: from the discovery of how to make porcelain and classic collectors’ items to modern hightech ceramics with applications in space travel and medicine. As the first porcelain producer in Europe, Meissen® still influences the style of table culture today. The Meissen works museum illustrates historical and modern porcelain craftsmanship. Approx. 300 000 visitors come each year to the Museum of MEISSEN® which tells the story of and displays the most complete collection of Meissen porcelain beginning in 1710 until the present. The museum is open 7 days a week all year long except of Dec 24 to Dec 26. Entrance fee is approx. 8,50 Euro and reduced rates for families, kids and persons with disabilities are available. The first European porcelain manufactory was founded on 6 June 1710 when Meissen’s global success story began. The first porcelain makers, led by Johann Friedrich Böttger, discovered the formula for making European hard-paste porcelain – a method that was kept a closely guarded secret. Because of this, no evidence remains today of the endeavours, working conditions or artistic and technical accomplishments of the first 153 years of the Meissen works. However, exhibitions make the attempt to fill in these gaps of information. Restaurant Meissen® serves light, mediterranean-style cuisine with seasonal and regional influences – on Meissen® porcelain, of course. The porcelain works offers three different gastronomic events for groups or individuals by prior arrangement. The first is “Tea, coffee and chocolate – three gourmet drinks”, an entertaining hour-long presentation of amusing and fascinating facts about these three beverages as well as the remarkable diversity of drinking vessels made by Meissen®. The second event is entitled “Meissen® table culture” and gives participants an enjoyable insight into tableware and eating habits past and present over a three-course meal served on famous Meissen dinner services of the past three centuries. The third event is a multi-course meal illustrating the links between Meissen porcelain® and wine. Wine-related patterns were some of the first motifs decorating Meissen® porcelain and still inspire its design to the present day. On request, the meal can be accompanied by a selection of wines produced by acclaimed Saxon wine makers. The Thuringian village of Reichenbach, situated close to the Hermsdorf autobahn interchange, has been dominated by the manufacture of porcelain since 1830, when Reichenbach artists first decorated delicate pieces with hand-painted motifs in their studios. In 1900 nine of the village’s porcelain painters joined forces and founded a porcelain manufactory, which formed the basis of Porzellanmanufaktur Reichenbach, the company that still employs a large number of local artisans. The local museum gives an insight into the village’s history with a recreation of a porcelain painter’s workshop from around 1900, collectible cups and a variety of temporary exhibitions. It also runs guided tours of the village and the restored church. Since the early days, production at the factory has been mainly by hand. Depending on customer requirements, domestic and ornamental porcelain is produced in a wide range of batch sizes and even as one-offs. Along with traditional patterns such as Blue Onion and Indian Blue the factory also creates innovative designer products. In 2006 it received the Federal Design Award for its Hombroiche collection. Gräfenthal, a long-established company producing ornamental figurines made and painted by hand, is also part of Porzellanmanufaktur Reichenbach. Its collection of 10,000 models for porcelain figurines represents an important element of the cultural history of Thuringian porcelain. Offers for visitor to Reichenbach include a creative course for groups, where participants can learn to decorate porcelain themselves under the watchful eye of a porcelain painter. While participants are having lunch in the village, the decorated pieces are fired at the factory so that they can be taken home. A visit to the factory outlet store rounds off the experience. Packages that give independent travellers a glimpse into porcelain production at Reichenbach are also available. Modern porcelain production in Kahla. Just a few years after porcelain production began at Munich’s Nymphenburg Palace, Duke Carl Eugen von Württemberg founded a fabrique de porcelaine in Ludwigsburg. The flamboyant reigning monarch loved extravagant parties, lavishly decorated dining tables and every sort of art. Through the appointment of the famous arcanist (porcelain alchemist) Joseph Jakob Ringler and the modeller and master painter Gottlieb Friedrich Riedel, the manufactory experienced its first blossoming soon after it opened in 1758. Ringler, who brought the hitherto closely guarded secret for making porcelain paste to the Ludwigsburg court, Riedel, who designed the unique Ludwigsburg scale pattern, and many other artists played a major role in the success of the manufactory. The Ludwigsburg porcelain factory is still one of the most important of its kind in Europe and employs around 30 people. Ludwigsburg porcelain is appreciated by connoisseurs from around the world, not least because the company remains committed to its old-established methods of crafting porcelain by hand. As well as the classic product lines, there is a strong focus on modern porcelain designs and one-off commissions, which – as tradition dictates – are all made and painted entirely by hand. The factory runs guided tours and the sheer diversity of shapes and decoration produced by Ludwigsburg can be appreciated in the exhibition and sales gallery at the palace. This former residence for the dukes and kings of Württemberg with its exquisite interior is among the largest and most magnificent of Europe’s baroque palaces. The surrounding parkland incorporates ornamental gardens, flower displays and a fairytale garden under its Baroque in Bloom theme. After Europe’s first porcelain manufactory was established in 1710 in today’s eastern Germany, the porcelain success story continued further north: among the factories that emerged in subsequent decades was the Fürstenberg porcelain manufactory in the town of the same name on the Weser river. With a history going back to 1737, it is one of the oldest manufacturers in Europe. What’s more, it is among the few to have enjoyed uninterrupted production since being founded whilst also remaining on the original site. until 15 August 2010 visually challenging pieces from the current Fürstenberg collection can be seen alongside selected porcelain from the museum’s collection in 14 groups. For example, there is a gilded teapot decorated with exquisite floral painting from the manufactory’s early years on display beside a modern, fully gilded equivalent. The juxtaposition of a flamboyant rococo candelabra with its modern parallel highlights the contrast between the periods. The exhibition is open on weekends only until 31 March 2010, after which it is open from Tuesdays to Sundays and on public holidays. Hours are 10am to 5pm. The Hütter porcelain works in Wernigerode is neither particularly large nor particularly old – far from it: founded in 1976, the factory is instead notable for being the smallest in Europe. It was founded by the designers Jürgen and Heidi Hütter and has remained a two-person operation ever since. These talented individuals produce one-off pieces made from genuine European hard-paste porcelain and do everything by themselves, whether it’s designing the pieces, preparing the raw materials or putting the porcelain in for firing at temperatures of 1,420° Celsius. After initially setting up in Erfurt, the Hütters moved to a timber-framed house dating back more than 100 years in Wernigerode in the Harz mountains. The Waechtersbach name represents more than 175 years of porcelain manufacture: in 1829, white clay was discovered in the Forest of Ysenburg-Waechtersbach and this proved to be the ideal material for making earthenware. In 1832, Count Adolf zu Ysenburg und Büdingen founded the factory which produced domestic crockery. After introducing various decoration processes for earthenware, the Waechtersbach works developed the world’s first underglaze color print in 1897. High-quality, technically accomplished craftsmanship provided the basis for an excellent standard of manufacturing. Waechtersbach ceramics, only known locally up to this point, now began to supply the entire German empire from its factory in the southern Vogelsberg hills. The company recorded an important milestone with its Waechtersbach art nouveau: this studio was founded in 1901, and in 1903 was incorporated into the earthenware factory as a dedicated ceramic art department. It also did work for the artists’ colony in Darmstadt. The Hessian company experienced a revival after the Great Depression and the Second World War: production resumed with the acclaimed designer Ursula Fesca on board and Waechtersbach became Germany’s largest ceramics manufacturer. Since the 1960s the company has also exported its products to America. Over the last 20 years, Waechtersbach ceramics have become collector’s items, attracting new fans all the time. Visitors can take a glimpse behind the scenes at the production site on a guided tour of the Waechtersbach Germany factory. These are held on the first Wednesday of every month and offer a fascinating insight into ceramics. For groups of ten or more, the company offers a guided tour of one of its ceramics workshops. Berlin’s royal porcelain manufactory (KPM) is one of the most highly respected producers of porcelain in the world. The company owes its name and its hallmark, the royal blue scepter, to the passion that the Prussian King, Frederick the Great, had for porcelain. He assumed control of the manufactory in 1763, taking it over from a Berlin businessman. Since 2006 the company has been under the sole ownership of Jörg Woltmann. KPM china is popular in fine dining restaurants and is also used at state and embassy receptions. Today, the company is based at the ‘KPM Quartier’ near the Tiergarten S-Bahn station. This is where KPM, which became famous far beyond Berlin’s boundaries over the course of its almost 250-year history, has its only production facilities. At KPM World, visitors can explore a permanent exhibition devoted to the design and production of porcelain down the ages. This is a top destination for those wishing to learn all about how porcelain is manufactured. KPM World gives visitors the chance to tour the oldest surviving manufacturing operation in Berlin. A corridor leads down to the model basement, the restored ring-chamber furnace hall and the display workshop. The latter reveals the various stages involved in porcelain manufacture and shows the modelers and painters at work. A wide variety of guided tours covering various areas of interest are also available. The ‘first Mecklenburg porcelain manufactory’ on the Wendenhof country estate in Schwerin proves that small doesn’t have to mean ordinary. The manufacturer is renowned for its square-shaped dinner services – unique and distinctive due to their painted edging in gold and various other colors. The range also includes stylized figurines and vases. On guided tours, visitors can find out how this ‘white gold’ is modelled, turned, cast and painted. Painting seminars and workshops are also offered. This year, the company will host a Christmas market on 20 November with some great porcelain bargains. Anyone wishing to learn about porcelain in more detail and enjoy a break surrounded by nature can rent one of the four holiday apartments on the Wendenhof estate. The historical neo-classical house was built at the end of the 19th century and was fully renovated in 1989. It is set in a vast park that extends as far as Schwerin’s Ziegelsee lake. Wendenhof is also commonly known as Bellevue because of the marvelous views it offers of Schwerin.